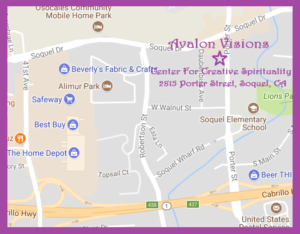 Avalon Visions was established July 2,1993. In August, 2017, after 24 years in Capitola Village, we moved up the street to the lovely quaint little Village of Soquel. Our new address is 2815 Porter Avenue, in Soquel! All with plenty of great free parking! Walk through the doorway and enter the mystic realms. Check out our classes and event section for the weekly schedule. Visit our events and classes page. 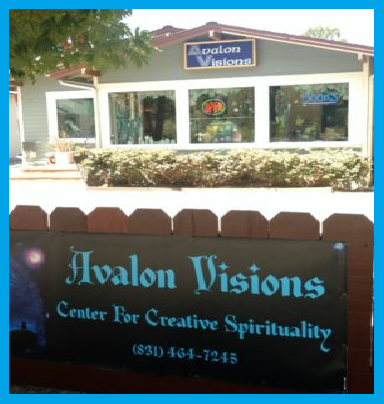 In July 2005, Avalon Visions was sold. For about a year and a half, the store went through a transitional phase. In May of 2007, the shop was sold again to Thomas and Gwen Thomas-Zia. With wonderful insight graciously offered from the creator of Avalon Visions, Cheryl Ban, the shop is as vibrant as ever. In March of 2014, Avalon Visions expanded into what had, for 15 years, been Havana Village, a small locally operated cigar store. Instead of purchasing cigars, and other tobacco related items, patrons were able to experience the healing energies that Avalon Visions had always been known for. The annexed area housed our readers and healers, and allowed us to showcase our aura camera. Classes and workshops were also held in our freshly painted and welcoming annexed area. In the summer of 2017, we made the a great decision to move our shop to a wonderful new location. We are now in lovely quaint Soquel Village. 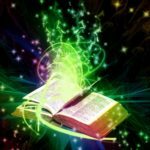 Our move has allowed us to grow into the Avalon Visions Center For Creative Spirituality, where we continue our dedication to bringing forth ancient arts that once flourished and receded into the mists, or out of our consciousness. 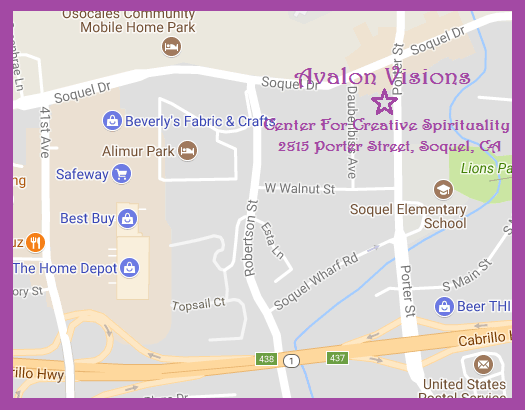 Avalon Visions Center For Creative Spirituality is a place where new visions are dreamed and reality is bordered only by the limits of imagination. Avalon Visions is the place where the veils are thin between the worlds, and where the mysteries are studied, explored and experienced. Our customers can now enjoy shopping at Avalon Visions on-line. Now you can enjoy shopping at Avalon Visions from the comfort of your living room. If you can’t make it into our shop, you can now browse through hundreds of items on line. Although some of what is available in our brick and mortar shop will not be available on-line, many more wonderful products are now available through our site.